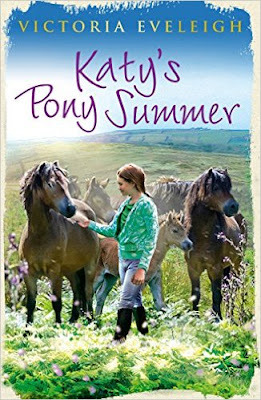 It's summertime at Barton Farm in Victoria Eveleigh's latest Exmoor Pony adventure. Katy is looking forward to a carefree summer on the farm, riding and having fun with her best friend, Alice. But all that changes when an injured foal leads to a mystery that no one can solve. It's up to Katy and her friends to discover exactly what's going on. Another fantastic instalment to this fun pony series! Warning, I'm a Victoria fangirl so am naturally biased towards loving her work. I love having another Katy tale because I always learn more about ponies and farm life. This time I learnt the dangers of poachers, which I'd also read in another book recently (that book was published a few years ago). The best part about Katy is that she makes mistakes. It's uncomfortable watching her do them, but she reminds me so much of myself personality wise that I feel very sorry for her when she gets overconfident. Thanks to the past she mostly knows to ask for help, but actually doing so is much harder, and leads to some embarrassment. Katy worries a lot about what others will think of what she sees as mistakes, but in actuality no one focuses on what she thinks they will. It was fun seeing James again, and having his autism helps Katy take better care of injured foal by being able to relate to it better. Her youngest pony Tink provides mischief in a way that makes me think of the girl Tink in Susie Day's Pea's Book of series! Thankfully that's a different world so double Tink mayhem doesn't happen, although Katy's Tink helps the injured foal in her own way. Katy matures a bit through the story which is a delight to see. I wonder what the next book will bring!